If you’re reading the information on this website, it’s probably because you or someone you know spends a lot of time playing video games. 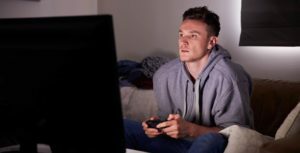 Hopefully, you’ve already read our articles about the symptoms of video game addiction and the consequences of gaming addiction. If not, this is a great place to start. You’ve probably wondered, “Is gaming addiction really that big of a deal?” Yes, it is that big of a deal. Gaming addiction can have serious physical, emotional, and social consequences. So what should you do if you know someone struggling with gaming addiction? Try and get your friend some help. Start by letting him know you’re worried about the amount of time he spends gaming. Show him this website; let him read the list of symptoms. Ask him if he thinks any of the symptoms describe him or his behavior. If he says no (which is likely), ask if you can show him the symptoms you see in him and why they concern you. When you’re talking to someone about possible gaming addiction, try not to be judgmental or angry. It’s common for a person who is confronted about addiction to get defensive. He might feel ashamed or embarrassed and not want to admit there’s a problem. Be honest about the behavior you’ve noticed and make sure your friend knows you’re talking to him about this because you care. Telling your friend you care about him is a great way to switch from talking about gaming addiction symptoms to possible consequences of the addiction. You can tell your friend that you’ve read about what can happen to people who are addicted to gaming and that you don’t want to see any of those things happen to him. If, after talking to your friend, he isn’t willing to admit there’s a problem, don’t give up. Talk to an adult you trust, like a parent or teacher. In many cases, the best person to talk to is your friend’s mom or dad. Because they live with him, they can keep an eye on his behavior and watch for anything unhealthy. If there is a problem, they have the best chance of helping your friend set good boundaries. Tell them the same things you told your friend: that you’ve read about the symptoms and consequences of gaming addiction and that you’re concerned. It may help to print out some of the articles from this website and take them with you, so your friend’s parents can read the information for themselves. If you’re reading this because you think you might have a gaming addiction, please talk to a parent, teacher, or counselor who can help you. Don’t feel embarrassed or ashamed. It takes a lot of courage to admit (even to yourself) that you might need some help.